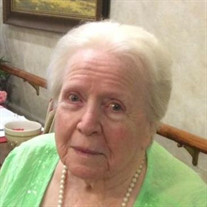 Meyette, Mary A. of Saginaw, our beloved mother, grandmother, and great-grandmother, passed away on January 19, 2018 at Edgewood Assisted Living Center. She was 99 years old. Mary Agnes Clark was born on December 30, 1918 in Flint, Michigan to the late Albert B. and Grace (McDonald) Clark. She married Philip J. Meyette on November 25, 1942; he preceded her in death on November 28, 1983. She was a proud graduate of Saginaw High School. Mary would later graduate from Saginaw General School of Nursing with the Class of 1941; she worked in her profession for many years. After retiring, she volunteered for Meal on Wheels, the Red Cross blood drives and at Holy Cross Children’s Services. She also worked at Holy Cross, retiring at the age of 88. Surviving are her daughter and son: Margo (Michael) Connelly of Rochester, NY and Philip C. Meyette and friend, Betty Marx of Saginaw; three grandchildren: Michelle (Richard) Skuse of Rochester, NY, Dr. Philip F. (Dr. Jilly Hobby) Meyette of Knoxville, TN, and Nannette Younan, Esquire of Romeo, MI and great-granddaughter, Elizabeth Younan. She also leaves two sisters-in-law, Theresa and Dorothy Clark and brother-in-law, Joseph Deneen; and many nieces, nephews, and dear friends. She was preceded in death by her husband of 41 years, Philip and granddaughter, Kelly Connelly. The family would like to extend a special thank you to all who loved and cared for Mary at St. Francis Home, Edgewood Assisted Living Center, and A&D Home and Hospice. FUNERAL: A Funeral Liturgy will take place at 11:00 a.m. on Monday, January 22, 2018, at Holy Spirit Catholic Church, 1035 N. River Rd. Rev. Peter J. Gaspeny. Private Rite of Committal of cremated remains will follow the service at St. Andrew Cemetery. VISITATION: Friends are welcome to visit with the family at the church Monday from 10:30 a.m. until the time of Mass. MEMORIALS: In lieu of flowers, those planning an expression of sympathy may wish to consider memorials to the Holy Cross Children’s Services, Holy Spirit Catholic Church or the Saginaw General Nurses Alumnae Association. Arrangements have been entrusted to the Deisler Funeral Home, 2233 Hemmeter Rd., (off State). Please share your thoughts and memories with the family at the church or through www.deislerfuneralhome.com.